World Champion Magnus Carlsen and Challenger Sergey Karjakin meet in New York from 11-30 November in the first World Championship match between a new generation of players. The 12-game encounter will draw the attention of the whole chess world, and in this series of articles Spanish IM David Martinez is going to look at what we can expect. He starts with a question that will be keeping the players awake at night - what chess openings will they play and face? First up, it's Magnus with White. 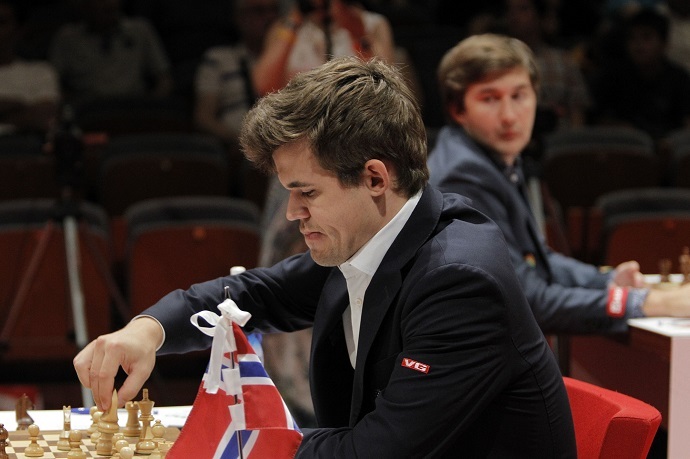 Norway's Magnus Carlsen will defend his title against Russia's Sergey Karjakin, who in his time was the most prodigious member of their generation (both were born in 1990). His achievement of gaining the grandmaster title at the age of 12 years and 7 months is still a world record, though the likes of Praggnanandhaa and Abdusattorov may soon have something to say about that. Most predictions, as you would expect, make the current World Champion and world number one a clear favourite. Carlsen has an 81-point rating advantage over the contender to his crown, or the same gap we can witness between Karjakin and the world no. 50. This isn't, though, the first time in recent years that we've witnessed similar "mismatches". 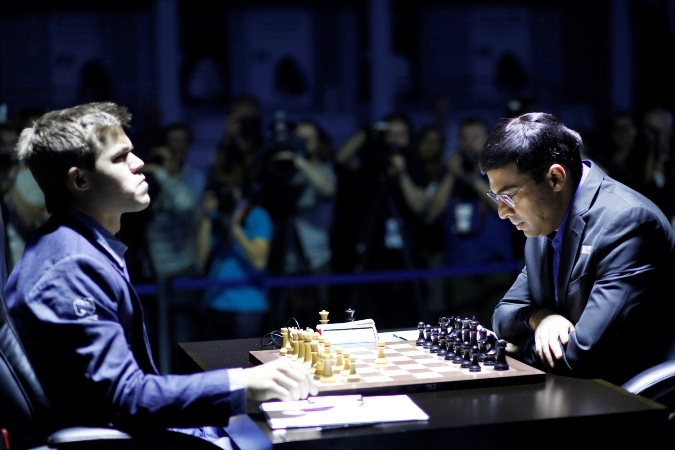 Carlsen himself outrated Vishy Anand by 71 points before their match in 2014, but that was no walk in the park and could easily have been very different if not for the tragi-comic mutual blunder in Game 6. In 2012 the Indian World Champion outrated Boris Gelfand by 64 points, but points count for little! Gelfand prepared extremely well, surprised his opponent with the Sveshnikov and tied the match over 12 games, only finally losing in the rapid playoff. Up to this moment Carlsen and Karjakin have met in 47 games, 21 of which were at a classical time control. Those resulted in 4 wins for Magnus and 1 for Sergey. Will we see a balanced match in a chilly November New York? Let's hope so! Karjakin's preparation will almost certainly be of the same calibre as that of Gelfand and Anand in the matches mentioned above. But what will it be? That's a favourite topic for chess armchair generals everywhere, and we've decided to devote some space to it - while realising that we're moving on shifting sands, in a terrain where surprises are the order of the day. In this first article let's speculate a little on the preparation of both players for the games in which the World Champion will have the white pieces. Magnus switches between 1.e4 and 1.d4 with complete ease, but I'd like to point out an important detail. In his World Championship matches against Anand, Magnus started with 1.Nf3 in 2013, which was firmly neutralised by excellent preparation from Anand. He then switched to 1.c4, but that only lasted a game, since perhaps he felt uncomfortable playing against the Triangle that Anand adopted. From that point onwards, each and every game of Carlsen's with the white pieces started with 1.e4, accepting that he would face the Berlin. The healthy theoretical status of the Berlin Wall endgame is still giving headaches to players with the white pieces, so Magnus of late has almost always met the Berlin with d3, following up by exchanging on c6 after the common Bc5. This position has been one of the great theoretical battlegrounds of 2016. Wei Yi scored a resounding win over David Navara, which boosted the popularity of the aggressive Anti-Berlin line with opposite-side castling. However, I don't think that all-action approach, putting the knight on c4, the queen on e2 and throwing the kingside pawns up the board, can withstand cold computer analysis. The victory of Laznicka over Duda at the Baku Olympiad is a good example of that. The result is food for thought: four wins, against So, Nakamura, Kramnik and Aronian! Of course, as we mentioned in the first paragraph, it can't be ruled out that Carlsen will open 1.d4 and take on Karjakin's great speciality, the Queen's Indian. Two victories this year might endorse that theory - against Emilio Córdova in the Baku Olympiad and against Pentala Harikrishna in Norway Chess. In the main line Karjakin invariably chooses the option with Ba6, while Carlsen likes to play 5.Nbd2 rather than the main move 5.b3. 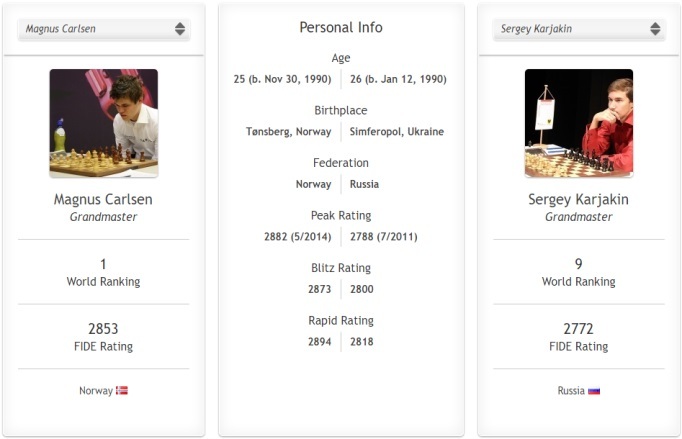 Carlsen and Karjakin have already met in this position twice, in 2014 and 2012, with both games ending in draws. Perhaps Karjakin is preparing 5...Bb7 here, going back since the knight on d2 is interfering with the queen's control of d5. After the natural 6.Bg2 Be7 7.0-0 0-0 White has as his main options 8.b3 or 8.Qc2. The Russian has reached this position five times, drawing all those games! The Queen's Indian, or perhaps similar lines with 1.Nf3, in my view offer more fertile ground for seeking out surprises than the Berlin. No doubt Team Magnus will be burning up hundreds of hours looking for potential paths to follow there. My bet? At first we'll get the Berlin... and then we'll see. But beware! As noted above, Carlsen started with 1.Nf3 and 1.c4 against Anand. Although both players want to surprise their rival I see Karjakin as more likely to repeat what he's done before, having gone into his lines to a depth unimaginable to mere mortals, while Magnus, true to his philosophy, tends to seek out playable positions in which both players need to think with their own heads. Will he manage to get those? And will Mamedyarov's aggression rub off on Sergey? What do you think? Which move will Magnus open with in his first white game of the match? Vote below! What will Carlsen's 1st move with White vs. Karjakin be?